The Solar System is our local neighborhood in space. This incredible system of celestial pobjects contains a star, eight planets, 140 moons, and a variety of other objects such as asteroids, comets, and dwarf planets. At the center the is an average-sized, middle aged yellow star known as the Sun. The eight planets and other bodies orbit the Sun in a perpetual dance that has been going on for nearly five billion years. The planets in this system range in size from small, rocky worlds to gigantic balls of gas and ice. These planets are orbited by a multitude of moons that vary from asteroid-sized chunks of rock to nearly planet-sized worlds with atmospheres of their own. Join us for a tour of our amazing Solar System. You may browse at will by clicking on any of the objects above, or you may take a guided tour by clicking on the arrow buttons at the top and bottom of this page. Use the arrow buttons to continue the tour, or you can break off and explore on your own at any time. The "Continue Tour" buttons will take you to the next stop on the Solar System tour, while the "Return" buttons bring you back to the previous stop. A navigation bar is available at the top of each page to assist you in your journey. All images in this section are courtesy of NASA unless otherwise noted. Click here for a list of credits & sources. For centuries, people have looked into the skies and wondered about the lights in the sky. They soon noticed that several of the lights seemed to move across they sky at regular intervals. They thought these objects were wandering stars, so they called them "planets," which comes from the Greek word meaning "wanderers." At the time, it was commonly believed that the Earth was at the center of the universe. Therefore, these lights that moved across the sky must be divine emissaries of the gods. Because of this, they gave them heavenly names. These five wandering lights became known as Mercury, Venus Mars, Jupiter, and Saturn. As the dark ages gave way to the renaissance, scientific knowledge started to evolve. People began to see the five visible planets as celestial bodies that orbited the Earth. In the 16th century, many enlightened scientists such as Galileo, Copernicus, and Kepler supported a new model for the Solar System in which the Sun was at the center and the planets revolved around it. With the invention of the telescope, it was discovered that the Solar System was much more complex than previously thought. The moons of Jupiter and the rings of Saturn were revealed. It was the beginning of a new age of discovery. As astronomers searched the night sky for more planets, Uranus and Neptune were soon found, followed by the discovery of a ninth planet to be named Pluto. Ever more powerful telescopes revealed new moons around Mars, Jupiter, and Saturn. By the time we reached the 20th century, we had the technology to leave our planet and explore the Solar System up close. A rare planetary alignment made the Voyager missions possible. Launched in 1977, these two spacecraft revealed never-before-seen details of the planets and discovered many new moons. 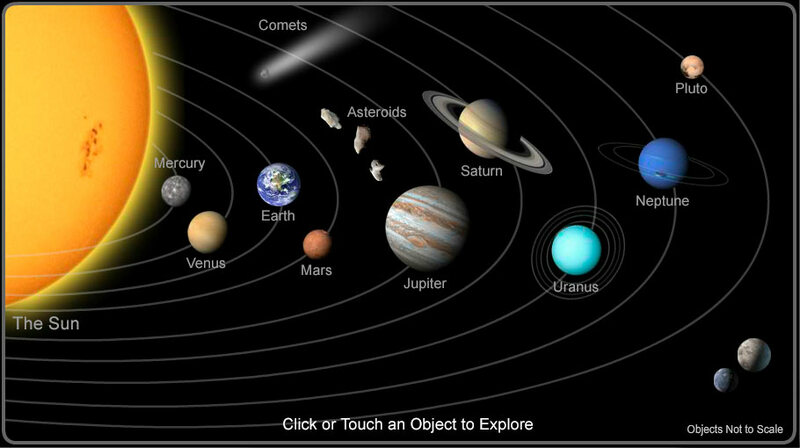 By the late 20th century, it was discovered that Pluto was only one of many small objects in the outer Solar System. In 2006, the international astronomical community voted to demote Pluto the the status of dwarf planet, bringing the official number of planets in out Solar System back down to eight. The Solar System as we know it today consists of the Sun, the eight planets and their moons, asteroids, comets, dwarf planets, and other assorted objects in the Kuiper belt and the Oort cloud beyond Neptune. The eight planets all orbit the Sun in the same direction and in the same plane, known as the ecliptic. The axis of rotation for most of the planets is nearly perpendicular to the ecliptic. The only exception is Uranus, which rotates on its side for unknown reasons. The Sun is the power plant that drives the Solar System. Its immense gravity holds the planets in orbit. Its energy drives weather systems on the planets with atmospheres. The Sun also provides energy for the vast majority of life on Earth. Without the Sun, it is unlikely that there would be any life forms inhabiting our blue planet. The Solar System is divided into two main regions. The inner planets consist of the four rocky, or terrestrial planets, Mercury, Venus, Earth and Mars, while the outer planets consists of the two gas giant planets, Jupiter, Saturn, and the two ice giant planets, Uranus, and Neptune. The asteroid belt divides these two regions. The inner planets are composed mainly of rocky materials such as silicates in their outer crusts and mantles and metals such as iron and nickel in their in their inner cores. The outer planets are composed mainly of gases such as hydrogen and helium. Beyond the orbit of the last planet, Neptune, lies two regions known as the Kuiper belt and the Oort cloud. The Kuiper belt is the home of dwarf planets and other small, planet-like bodies. Much farther out, the Oort cloud is the home of the icy comets. Very little is known about the objects in these two regions, but NASA's New Horizons spacecraft is scheduled to reach Pluto in 2015 and may solve many of the mysteries of the last frontier of the Solar System. Click here to begin your Tour of the Solar System now.